Did I mention that I went to Japan? I think I may have said something about it. When I was in Kyoto, I discovered a sweet mochi-ish treat that was flavored with matcha and rolled in a nutty tasting flour, which I found out was soy, known as Kinako powder. The woman who settled me into my Ryokan told me that particular sweet was something only found in Kyoto, and so I bought a box of the treats and brought it home. A Google search tells me it was probably warabi mochi, but the box I bought turned out to be flavored with what I think was Ume plum, but definitely not matcha. Then, when I was walking around and freezing my face off in Tokyo, I stumbled across a Doughnut Plant, which angered me for two reasons, that 1) we don't yet have one here in SF yet Tokyo does, and 2) they weren't selling the creme brulee donut, my favorite. So I bought a matcha glazed donut, which was massive and actually had a little too much matcha for my liking. It was dark and bitter and dammit, I wanted creme brulee anyway. So, by the time I got home, I was craving that matcha and kinako combination and a better donut. Why not combine all three? I remembered mochi donuts that I made a year or so ago, and decided to glaze them with matcha and sprinkle with kinako powder. 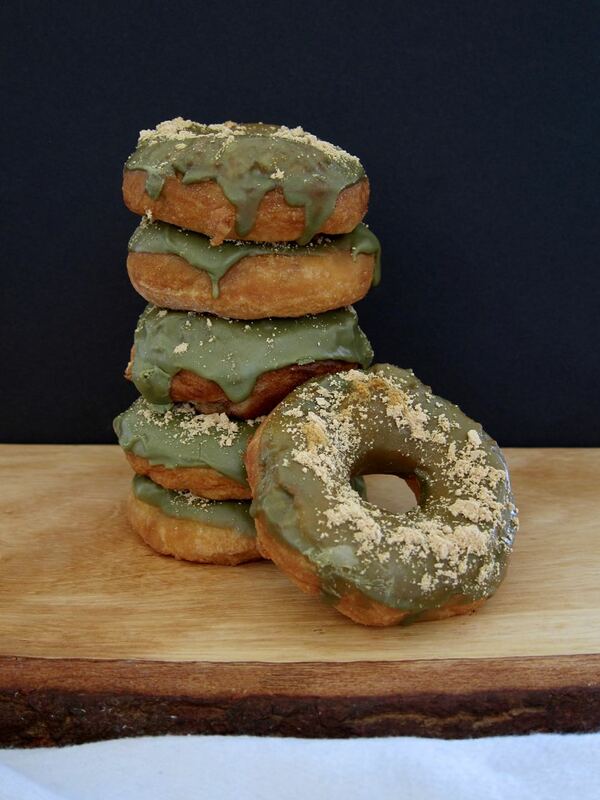 This time, the matcha was just the right balance of bitter and sweet, and the kinako powder adds a nutty contrast, while underneath, the chewy, crispy, mochi donut holds it all in place. These are excellent. But eat them fast! They won't last. Make starter dough: mix rice flour and milk together in a small bowl and microwave one minute at 20 second intervals, stirring, until dough is cooked through. It will be opaque and very bouncy. Cool 5 minutes. Make dough: Add rice flour, remaining milk (minus 1 tbs), melted butter, granulated sugar, egg, and baking powder in a stand mixer fitted with the dough hook. Add the starter dough and knead on low until it comes together, then on medium until starter is completely blended in. The dough should be wet and sticky, add the remaining tbs milk if not. Turn dough onto a surface dusted with more rice flour, sprinkle enough onto the dough to prevent sticking, and roll to 1/2 inch thick. Cut as many rounds as you can with a doughnut cutter or a round biscuit cutter (I used a piping tip to cut the center holes). Reroll, and cut more rounds. Heat 1 1/2-2 inches of oil in a large, deep pot to 325 degrees. Drop doughnuts into the oil, they will sink and then float to the surface (you may need to use a long spoon or chopstick to help release if they stick to the bottom of the pot). Fry on each side for a few minutes, until puffed up and golden brown. Drain on a rack. Make the glaze: Whisk the melted butter and matcha together in a small bowl. Add the sugar and hot water as needed to form a glaze. Dip one side of each donut into the glaze, and sprinkle on kinako powder, if using.